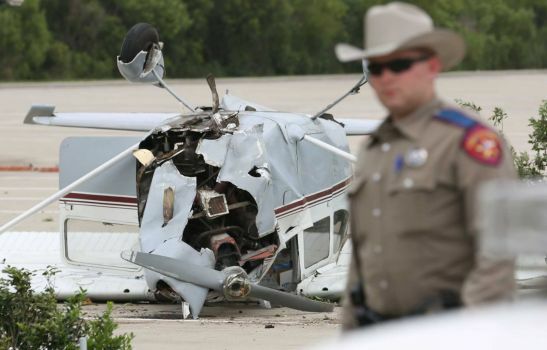 On July 3, 2015, about 1200 central daylight time, a Cessna 172D airplane, N2320U, collided with terrain during a forced landing in Shenandoah, Texas. 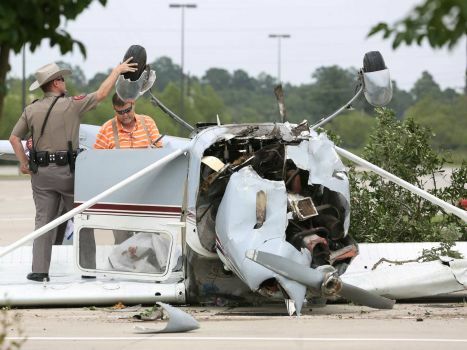 The pilot sustained minor injuries, and the airplane was substantially damaged. The airplane was owned by the private pilot and operated under Title 14 Code of Federal Regulations Part 91 without a flight plan. Day visual meteorological conditions prevailed for the personal flight that departed Cleveland Municipal Airport (6R3), Cleveland, Texas, about 1100, with the intended destination of Weiser Air Park (EYQ), Houston, Texas. According to the pilot, the airplane's wing tanks were topped off with fuel before he departed on the flight. The pilot stated that fuel samples drained from each wing tank during his preflight were consistent with 100 low-lead aviation fuel and did not contain any water or debris. 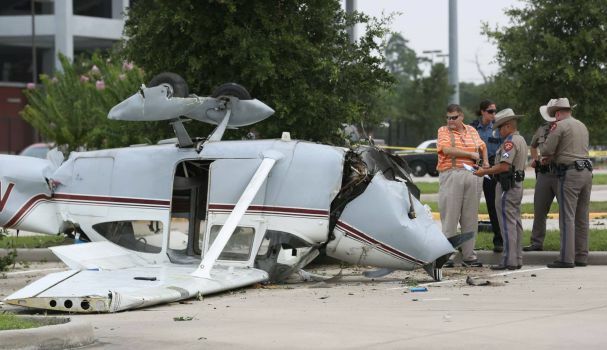 The pilot did not observe any anomalies with engine operation during his pretakeoff runup. After an uneventful takeoff, the pilot overflew the Lake Livingston area for about 30 minutes before continuing toward his planned destination (EYQ). 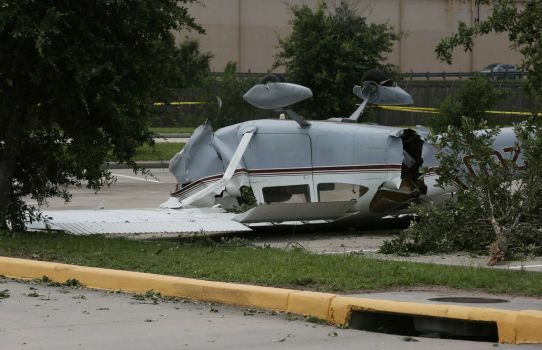 While established in cruise flight, at 1,600 ft mean sea level, about 10 miles north of David Wayne Hooks Memorial Airport (DWH), the engine experienced a partial loss of engine power. 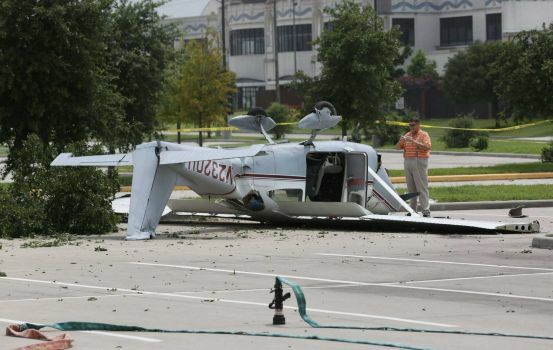 The pilot reported that the engine "suddenly began to sputter and lose power." The pilot applied carburetor heat, selected a full-rich mixture setting, and verified that the fuel selector valve handle was set on BOTH. The pilot's corrective actions did not restore full engine power and he declared an emergency with the tower controller at DWH. The flight was cleared for an immediate landing on runway 17 at DWH; however, shortly after receiving the landing clearance, the engine experienced a total loss of power. 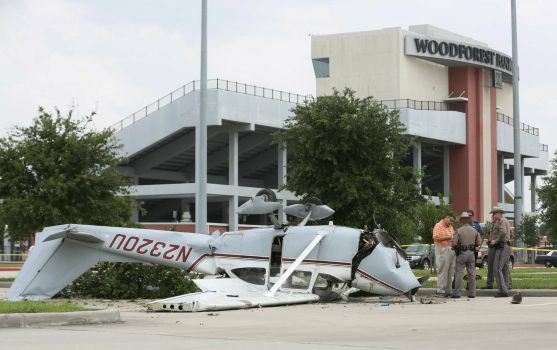 The pilot reported that he trimmed the airplane for best glide airspeed and made a forced landing to a vacant parking lot at a nearby sports stadium. 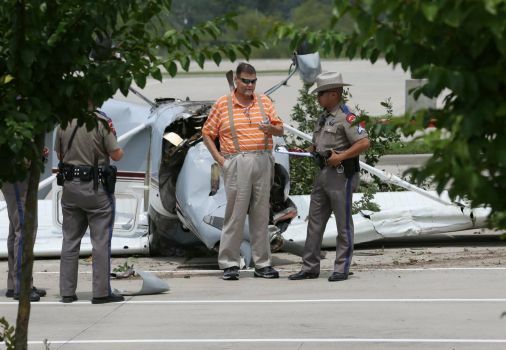 He was unable to stop the airplane during landing roll before it collided with a concrete curb. The impact with the curb collapsed the nose landing gear and the airplane subsequently nosed over. The fuselage, wings, and empennage were substantially damaged during the forced landing. A postaccident examination of the airplane and its engine was completed by Federal Aviation Administration inspectors and a representative with the engine manufacturer. Engine control cable continuity was confirmed from the cockpit controls to their respective engine components. The carburetor heat control cable remained attached to the airbox; however, the airbox was crushed during impact, which precluded normal movement of the carburetor heat valve. The fuel selector valve was positioned to draw fuel from both wing fuel tanks. Examination of the fuel gascoloator revealed a small amount of water and no fuel; however, the airplane came to rest inverted at the accident site and was subsequently recovered in an inverted attitude. Further inspection of the gasoclator did not reveal any particulate contamination. 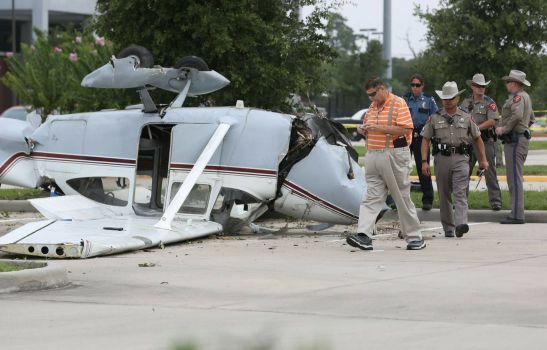 The fuel quantity was not measured at the accident site because the airplane was inverted. The engine, a Continental O-300-D, serial number 28116-D-3-D, remained partially attached to the airframe. The engine was separated from the airframe to facilitate an examination. The engine case remained intact with the accessory components still attached to their respective installation points. The upper spark plugs exhibited features consistent with normal engine operation. Internal engine and valve train continuity were confirmed as the engine crankshaft was rotated. Compression and suction were noted on all cylinders in conjunction with crankshaft rotation. Both magnetos remained attached to the engine case and provided spark on all posts while the crankshaft was rotated. Both impulse couplings released simultaneously when the No. 1 piston was moved to the top-dead-center position during the compression stroke. The correct firing order was observed as the crankshaft was rotated. A borescope inspection of each cylinder did not reveal any anomalies with the cylinders, pistons, valves, or valve seats. The oil filter was crushed during impact; however, removal and inspection of the filter element did not reveal any metal debris. The disassembly of the carburetor revealed no water, corrosion, or debris in the bowl assembly. Functional testing of the carburetor accelerator pump produced a normal fuel discharge. A visual examination of the carburetor fuel inlet screen revealed no evidence of debris. The float and needle valve were attached and moved freely by hand, and the needle valve seat was clean. The propeller remained attached to the engine crankshaft. Both propeller blades were bent aft near each blade tip, and neither blade exhibited spanwise S-shape bends or leading-edge damage. The postaccident examination did not reveal any anomalies that would have precluded normal engine operation during the flight. The fixed-base operator where the airplane was fueled before the flight completed fuel testing after the accident. The fuel testing revealed no evidence of water or debris of their 100 low-lead aviation fuel source. According to the Pilot Operating Handbook for the Cessna 172D, the airplane had a total fuel capacity of 39 gallons (36 gallons usable) and a fuel endurance of 4.2 hours at 2,500 ft msl and 75% engine power. At 1153, about 7 minutes before the accident, the DWH automated surface observing system reported: wind 230° at 4 knots, few clouds at 3,400 ft above ground level (agl), scattered clouds at 4,100 feet agl, 10 mile surface visibility, temperature 32°C; dew point 24°C; and an altimeter setting of 30.00 inches of mercury. According to a carburetor icing probability chart contained in FAA Special Airworthiness Information Bulletin CE-09-35, entitled "Carburetor Icing Prevention", the recorded temperature and dew point were in the range of susceptibility for the formation of carburetor icing at glide and cruise power settings. An article on carburetor icing published by Flight Safety Australia stated that if ice forms in the carburetor of a fixed pitch propeller aircraft, the restriction to the induction airflow will reduce power and result in a drop of engine rpm, which might be accompanied or followed by a rough running engine as the fuel/air mixture ratio is upset. Applying carburetor heat introduces less-dense hot air which will cause a further drop in engine rpm. Additionally, the article stated that if a pilot delays applying carburetor heat until after the engine begins running rough, the exhaust gas temperature might be insufficient to produce hot air in the exhaust muffler, which could render the use of carburetor heat ineffective at melting the accumulated ice. 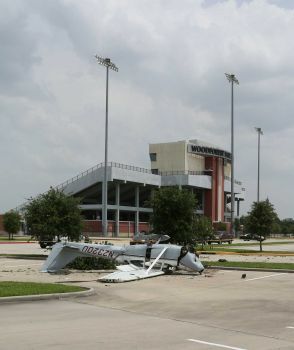 On July 3, 2015, about 1200 central daylight time, a Cessna model 172D airplane, N2320U, was substantially damaged during a forced landing in Shenandoah, Texas. 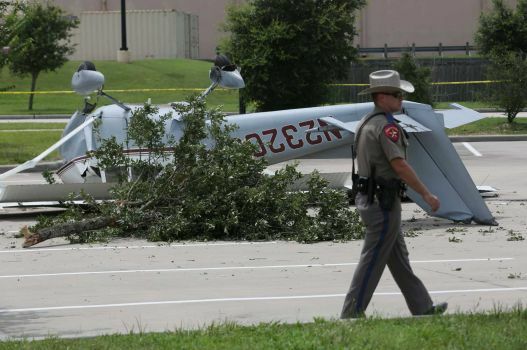 The pilot, the sole occupant, sustained minor injuries. 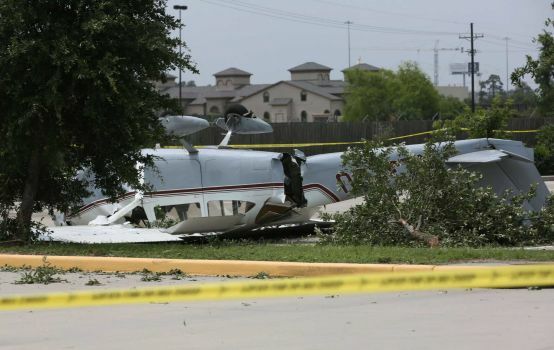 The airplane was registered to and operated by the private pilot under the provisions of 14 Code of Federal Regulations Part 91 without a flight plan. Day visual meteorological conditions prevailed for the personal flight that departed Cleveland Municipal Airport (6R3), Cleveland, Texas, about 1100, and had the intended destination of Weiser Air Park (EYQ), Houston, Texas. According to the pilot, the airplane wing fuel tanks were topped-off before departing on the accident flight and samples collected from each wing fuel tank were consistent with 100 low-lead aviation fuel and did not contain any water or particulate contamination. The pilot reported that no anomalies were noted during his pretakeoff engine run-up and a normal takeoff was performed. After departure, the pilot overflew the Lake Livingston area, for about 30 minutes, before deciding to turn toward his planned destination (EYQ). 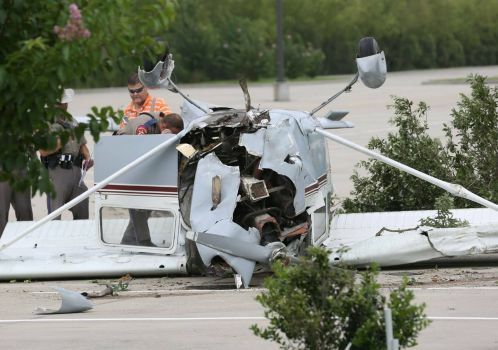 While established in cruise flight, at 1,600 feet mean sea level (msl), about 10 miles north of David Wayne Hooks Memorial Airport (DWH), the engine experienced a partial loss of engine power. 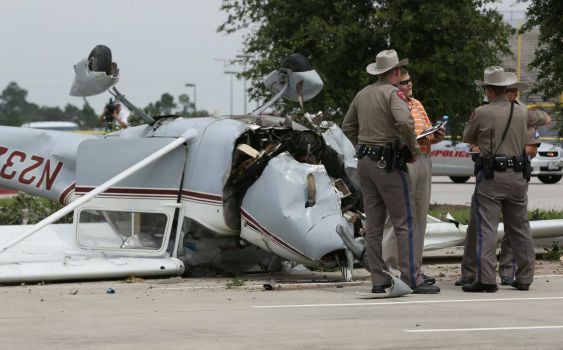 The pilot reported that the engine "suddenly began to sputter and lose power." The pilot applied carburetor heat, full mixture, and verified that the fuel selector was set on BOTH. The pilot's corrective actions did not restore full engine power; however, he noted that the oil pressure and temperature gauges displayed normal values. He reported that the engine operation was still erratic when he declared an emergency with the DWH tower controller. The flight was cleared for an immediate landing on runway 17; however, shortly after receiving the landing clearance, the engine experienced a total loss of engine power. 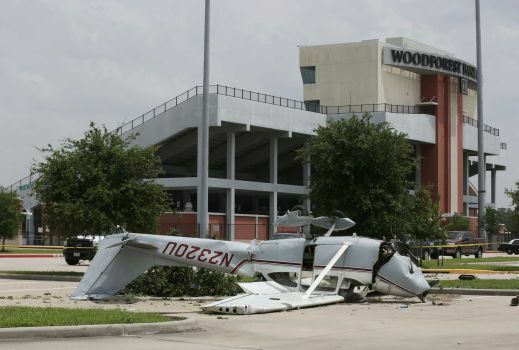 The pilot reported that he trimmed the airplane for best glide airspeed and performed a forced landing to a nearby vacant sports stadium parking lot. 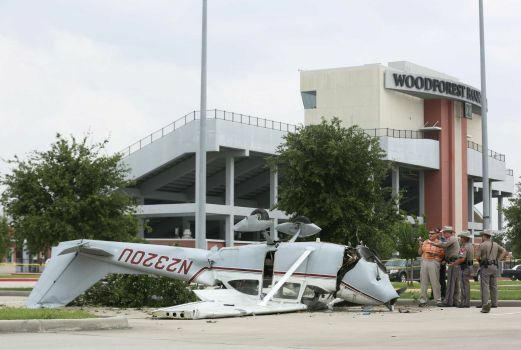 The pilot reported that he was unable to stop the airplane before it impacted a concrete curb located at the far end of the parking lot. The impact with the curb collapsed the nose landing gear and the airplane subsequently nosed-over. The fuselage, wings, and empennage were substantially damaged during the forced landing. At 1153, the DWH automated surface observing system reported: wind 230 degrees at 4 knots, few clouds at 3,400 feet above ground level (agl), scattered clouds at 4,100 feet agl, 10 mile surface visibility; temperature 32 degrees Celsius; dew point 24 degrees Celsius; and an altimeter setting of 30.00 inches of mercury. So the NTSB is now making reference to Australian safety publications. Certainly there is a similar document somewhere in the plethora of FAA stuff. And hey, doesn't everything work backwards down there?